Home › Home and Kitchen › Ice Ball Maker Sphere Mold Creates Perfect 2.5 Inch Round Ice Cube Balls -Set..
Ice Ball Maker Sphere Mold Creates Perfect 2.5 Inch Round Ice Cube Balls -Set.. CREATE LARGE SIZED ICE BALLS: The Chuzy Chef plastic ice ball maker can make the perfect 2.5 inches sphere ice ball because of it's revolutionary design. Measuring at 3 1/2 inches in diameter and 6 inches high it is structured to always deliver with the perfect sized ice balls. 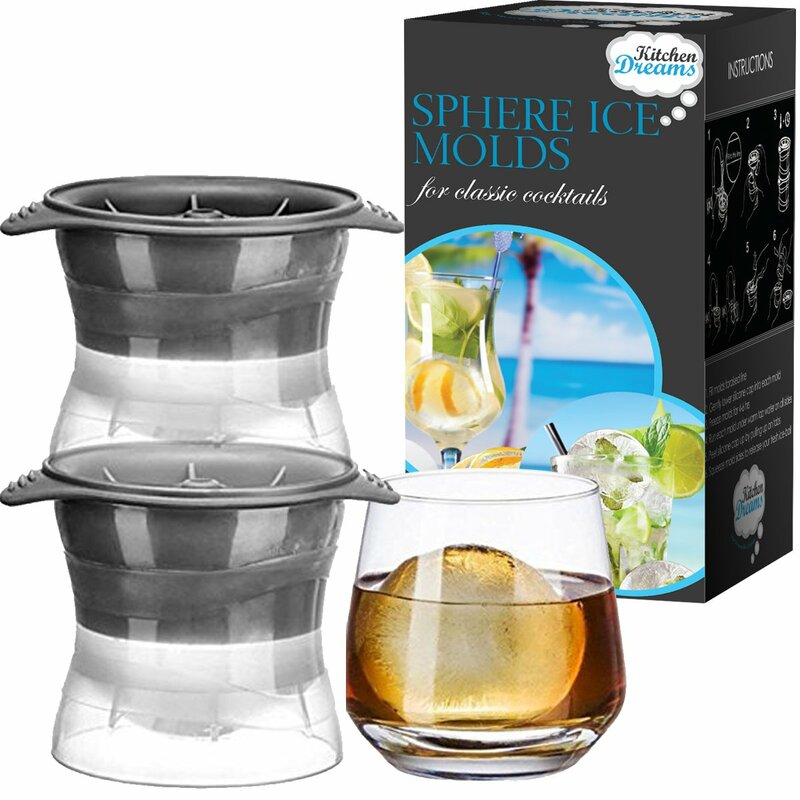 SPECIAL TWO PAIR MOLD SET: This Plastic Ice Making Sert Features TWO trays which makes one large ice ball each. Your guests will be thrilled when they see these stunning iceballs. .
REUSABLE: Chuzy Chef plastic ice ball molds are reusable so you don't have to spend money on getting new molds. These molds also come with a lifetime guarantee. DISHWASHER & MICROWAVE SAFE- Our ice maker is both dishwasher and microwave safe. So when you are done all that you have to do is pop them in the dishwasher for a fast and easy clean! ENTERTAIN YOUR GUESTS WITH CHUZY CHEF® ICE BALLS Make your sleepovers,birthday parties and dinners more exciting with a Chuzy Chef® silicone iceball making mold. With this special edition 2 Pair Set Tray you can preparefrozen items per tray at time. An exciting feature of our ice balls as thatthey take much longer to melt than the typical ice cube does so they keep yourdrink colder longer. You can choose to freeze ice to add to an alcoholicbeverages or juice. You can freeze fruits, chocolate and more! Thepossibilities are endless when you get your creative juices going. Whateveryou choose to use, you will get your guests talking easily with our product.Chuzy Chef® ice ball makers are the ultimate ice breaker for any party! CHUZYCHEF® ICE BALL MAKER MOLDS MAKE PERFECT SNOW BALLS & ECO-FRIENDLY! Chuzy Chef®silicone ice ball molds are amazing and release your frozen surprise easily.The snowballs that the mold produces are cute, realistic and visuallystunning. Our Snow Ball Forming Molds are microwave and dishwasher safe too.Our products are also very safe to use and eco-friendly. They are BPA free,reusable, and built to last! When you buy a Chuzy Chef® product you are buyingsomething that can last a lifetime. Chuzy Chef® Ice Ball Maker Features:• OurIce Balls Melt Slower Than Ice Cubes• Set of Two• Silicone Composition•Dishwasher Safe• Makes perfect 2.5 Inches ice balls• Each silicone moldmeasures 3 1/2 inches in diameter and 6 inches high. Make your parties moreexciting with a Chuzy Chef® ice ball maker today.